Why “R-value” is not as critical as you might think. I can’t tell you how many times I’ve been scoffed at by a potential customer comparing price per R-value of an “R-19/R30” fiberglass job bid to an “R-7/R-13” spray foam job bid. They have a hard time believing me when I say that when you go with closed cell spray foam, you don’t need nearly as much “R-value.” It’s as if I were trying to pass closed cell spray foam off as some sort of “magical miracle material.” Or maybe they think I am trying to swindle them? What’s ironic about that is I am actually trying to save them money, while providing them with a superior insulation material! I understand closed cell spray foam is a fairly expensive product, and to install it to a R-value specification developed and recommended for poor performing insulation like fiberglass would price it right out of the game for many people. 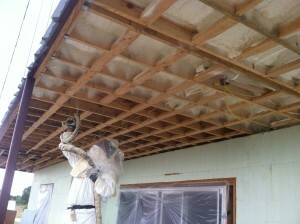 But the truth is that R-value is not the only factor to consider with insulation. 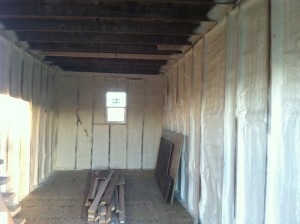 In fact, it’s only one of many factors involved in the science of properly insulating a building. Unfortunately, “R-value” seems to be all anyone thinks about. It’s mostly due to an industry with severely outdated standards, designed for outdated materials. Building code is notorious for being slow to accept change, and spray foam insulation technology is relatively new to construction, compared to older insulation materials. It’s also due in part to me not being able to adequately educate “would-be” customers on the science of insulating a building. Hopefully this article will shed some light on the subject. “R-value” ratings are determined using a standardized lab test, and “R-value” is strictly a measurement of “a material’s resistance to conductive heat transfer.” Don’t get me wrong, this is an important factor, but it’s not the only way heat is transferred in or out of a building. In fact, there are three primary ways this happens. Conduction is the transfer of heat within a solid object or between solid objects in direct contact with each other. Think about frying bacon on your stove. When the pan is placed on the hot stove burner, the bottom of the pan gets hot. If you were to touch the inside of the pan after just a few seconds, it would already be hot. This is because your pan is a good conductor of heat. It would have a very low “R-value”. Now, when the bacon is placed in the hot pan, it begins to heat up and cook. Again, this is conduction of heat from the pan into the bacon, which is in direct contact with the hot pan. (Coincidentally, bacon would also have a fairly low “R-value.”) This is the only type of heat transfer that “R-value” pertains to. I will explain why this is a nearly irrelevant factor for comparing conventional insulation to spray foam in just a minute. 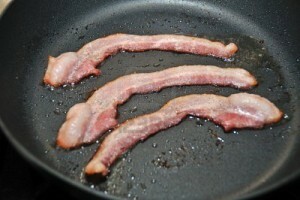 Heat is conducted from the bottom of the pan to the top, and then conducted again into the bacon. When you blow on hot coffee, you are cooling it down with convection. Radiation is when heat is transferred from one object to another through electro-magnetic waves. Let’s think about our microwave ovens for a second. When I was a little kid, I thought they operated on principles of magic. Well, as it turns out, they use electro-magnetic waves to transfer heat into my leftover baked potato. Now lets think about the hot sun in the sky, beaming down on us here in Texas almost every day of the year. Surely, all of us Texans know that in the summertime, the best parking spot is not necessarily the one closest to the front door, but rather the spot with the most shade. We can all relate to getting into a hot car or truck that has been parked in the sun, and getting burned by every surface inside the car that touches your skin. This is thanks to heat transferred into the car from the sun by Radiation. When you park in the shade, the radiation from the sun is blocked from reaching your vehicle. The same radiation is also transmitting heat to your house, which is absorbed by your roof, walls, and through windows. When you stand next to a wall that is warmer or cooler than the air temperature in the room, you can feel it. If the wall is hotter, you can feel the heat radiate to your body, making you warmer. If it’s colder, you can feel your body heat radiating to the wall, making you feel colder. 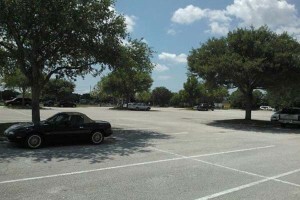 Parking in the shade prevents the sun from transferring heat to your car by means of radiation. It is important to understand that heat will always make its way into cooler objects. This is an unstoppable force of nature! Even though we cannot completely stop it, we can slow it down. This is where insulation comes into the picture. Insulation’s job is to slow down the transfer of heat from the outside of an object (in our case, a house or building) to the inside. Still with me? I know it’s a lot of information, but it’s important to know if you want to make an informed choice on insulation. Imagine if you were shopping for a new work truck, and you only focused on miles per gallon. The window sticker on your new truck claims an EPA rating of 20 mpg. When you load the truck up with a 4,000 lb. trailer, and check your mpg, it’s more like 10 mpg! What gives?! Turns out the EPA rating is done in a laboratory, with no weight in the truck, and doesn’t take into account wind resistance or any other real world factors. This would be like comparing insulation based strictly on “R-value” and price. It may look good on paper, with data collected from a lab test, but the real world results usually tell a different story. R-value recommendations vary across the country, mainly based on the average climate of an area. Generally speaking, the colder the climate, the more insulation is recommended. (Coincidentally, traditional insulation like fiberglass and cellulose lose a tremendous amount of “R-value” as the temperature gets colder. More about this later…) Here in Central Texas, R-value recommendations are at minimum R-13 for walls and R-30 for ceilings. This is the lowest recommended value on the chart, because as we all know, it is HOT in Central Texas, for the majority of the year. Here’s what is important to understand about “R-value”. As I mentioned before, it is strictly a measurement of how poorly a material transfers heat by CONDUCTION. It does not give any indication of how well the material blocks radiant heat flow, and more importantly, air movement that causes convection heat flow. 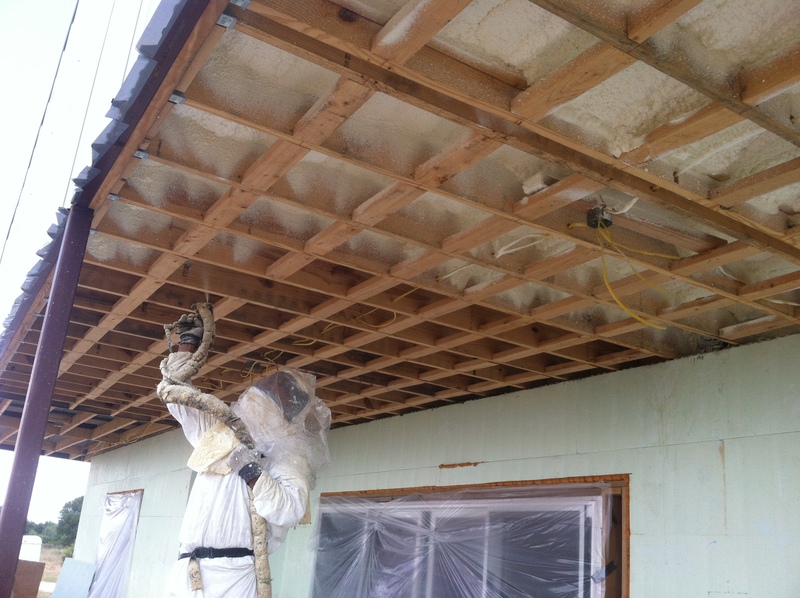 Convection plays a MAJOR part in how insulation performs in the real world. 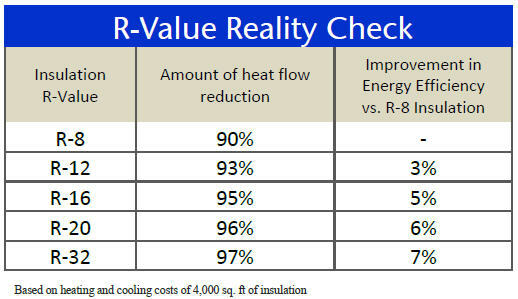 What is interesting is that an R-value of R-8 will reduce conductive heat flow by 90% compared to no insulation. That’s a huge improvement with a relatively small R-value! Double that to an R-16, and now conductive heat flow is reduced to 95% compared to no insulation. Double that again to an R-32, and conductive heat flow is reduced by 97% compared to no insulation. This chart illustrates why adding more insulation does not always make the most sense. Notice a trend here? We quadrupled the amount of insulation, from R-8 to R-32, and thus quadrupled the cost of materials, not to mention the added labor cost. But only gained an additional 7% improvement. Adding R-value follows a law of diminishing returns. So why do they recommend so much insulation? These recommendations are written with fiberglass batts and loose fill insulation in mind. 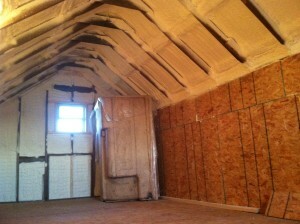 Spun fiberglass and loose fill have long been the standards for cheap insulation. Before they hit the scene, there was basically no insulation used in buildings and houses at all! 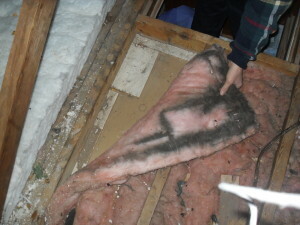 They were a big improvement, but these types of insulation have some fundamental flaws. The biggest problem is that air can readily pass through them. In fact, spun fiberglass is also commonly used as an air filter medium, because air can pass through it so easily, and it does a good job at collecting the dirt, dust, pollen, etc. from that air. (Some insulation experts refer to it as “filterglass”.) 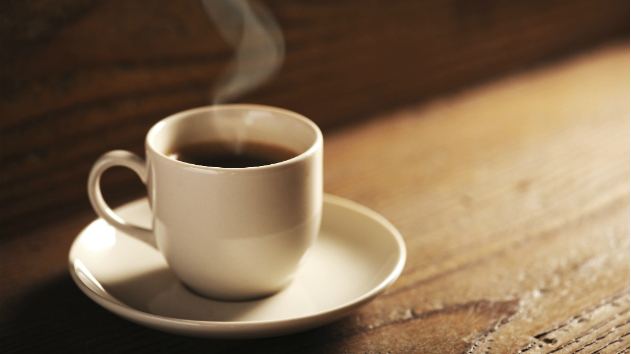 Think about blowing on the coffee we talked about earlier. Guess what happens to the “R-value” of an insulation while air is flowing through it? If you guessed that it drops down to practically nothing, then you are right! Remember earlier, when we were talking about convective heat transfer, and all the air leaks that a typical building or house has? Think about what happens when the wind blows into all those cracks and crevices. It flows through these types of insulation and ends up exchanging heat with the air inside your house (the air you paid good money to condition.) This is known as “Air Intrusion”. In the winter this means your warm, inside air gets pushed outside and replaced with cold winter air. In the summer, it’s your nice, cool air being traded for hot summer air. This is why they call it “filterglass.” Dust particles are trapped in the insulation as air passes through it. Not only does the R-value suffer, but who wants all that nasty stuff in their walls and ceiling? Convection also takes place within insulation types that air can pass through in the form of “Convection Loops”. This happens when the temperatures are different from one side of the insulation to the other. The greater the difference from one side to the other, the more heat is transferred through the convection loop. When the outside air is 30 degrees, and its 70 degrees in your house, that equates to a 40 degree temperature differential, and can result in a 25% reduction in “R-value” just by convection loops! Air touching the warmer side begins to rise, while the air in contact with the cooler side will fall. This creates a loop within the insulation and effectively transfers heat from the warm side to the cool side. This is the opposite of what we want to happen, and again, reduces the real world “R-value”. Another factor that reduces an insulation materials R-value is moisture content. When conventional insulation absorbs moisture, (which it will, because the air passing through it is loaded with moisture), it now conducts heat much better. Think about putting a cool, wet rag on your forehead when you have a fever. If it were dry, it wouldn’t cool you down nearly as well, because it doesn’t conduct heat as well. Remember that “R-value” is how poorly a material conducts heat? So by adding moisture to the rag, we improve its ability to conduct heat, thus lowering its “R-value.” Cool rag on your forehead + moisture = good. Building insulation + moisture = bad. Loose fill insulation, or “blown in insulation”, is typically installed on attic floors. Cellulose, fiberglass, and rock wool are the most common forms. They are popular among builders because they can create a very high “R-value” for a relatively low price. Once again, their “R-value” rating is seriously reduced by the same real world conditions; moisture, air intrusion, convection loops, etc. What is also important to know about loose fill insulation, is that the “R-value” rating assumes that it is actually “loosely filled.” Over time, gravity pulls the insulation down and compacts it, which also causes a major reduction of its “R-value”. Hopefully by now you are beginning to understand what I mean when I say “R-value is not as critical as you think.” No doubt it plays an important part in the science of insulation, but certainly should not be the only factor to consider when comparing options. So what does all of this mean to me and recommended “R-values”? Well it’s pretty simple, really. These recommendations are meant to try and compensate for the factors that reduce real world “R-value” of traditional types of insulation. It’s similar to putting on extra shirts when it’s cold AND windy to compensate for the “wind chill.” Putting on five long sleeve shirts will help you stay fairly warm, but you will still have cold wind coming in around your collar, sleeves, etc. Now imagine having a full body suit that completely seals out any wind. Wouldn’t need as many shirts to stay warm, would you? If any of you have ever ridden a motorcycle on a cold day, then you know exactly what I’m talking about! 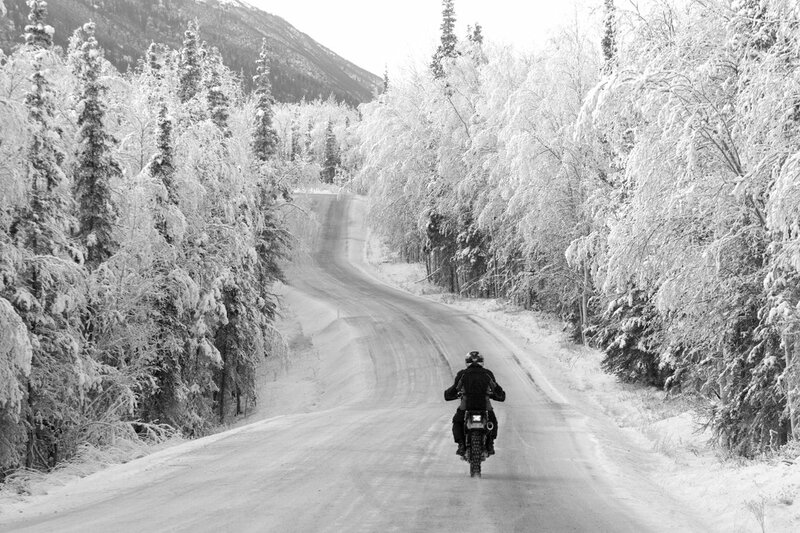 Imagine how cold this guy would be if 30 degree wind was finding its way inside his riding gear! Remember that convection is when a liquid or gas (air) moves across something and transfers heat? Remember all those cracks and crevices for wind to leak through that we talked about earlier? Spray foam fills these voids, and expands in place to ensure that “Air Intrusion” is stopped in its tracks, keeping outside air outside, and conditioned air inside. This is probably one of the biggest improvements of spray foam insulation over fiberglass and “blown in” insulation. As an added benefit, filling these voids also blocks all of the dust/dirt/pollen from entering these places, not to mention bugs, rodents, etc. So what about “Convection Loops”? The only “loops” in a spray foamed structure are the fruity ones in a cereal bowl! Since the interior surface temperature of the spray foam insulation is typically the same as the air temperature inside the room, there is no difference in temperature to create a convection loop. Furthermore, convection loops cannot occur inside the foam itself, because spray foam is considered an “air barrier”. Air is unable to pass through it, and air is unable to flow inside it. Well what about moisture content? Closed cell spray foam is considered a Class II Vapor Retarder at a thickness as little as 1″. What this means in a nutshell is that closed cell spray foam will only allow an EXTREMELY SMALL amount of moisture vapor to pass through it, and thus will never be able to accumulate any significant amount of moisture. In a structure insulated with spray foam, the interior temperatures of the walls and ceiling tend to be very close to the inside air temperature, so there is no radiant heat felt from them. This is the ultimate form of heat flow. This is what the term “R-value” was invented to describe in the first place. This is the ONLY FORM OF HEAT TRANSFER that the R-value test pertains to. Since closed cell spray foam is made up of millions of tiny bubbles, filled with an inert gas that is a very poor conductor of heat, it has a very impressive “R-value.” One inch of closed cell foam is rated at approximately R-6.5. That’s just ONE INCH! That is approximately twice the “R-value” per inch of all the other common forms of insulation, including open cell spray foam. So now that we’ve covered what factors play a major part in the reduction of real world insulation performance, we are down to the grand finale of this article. This is where we put it all together and hopefully have that “a-ha” moment where, (if you hadn’t already figured it out), it all makes perfect sense! 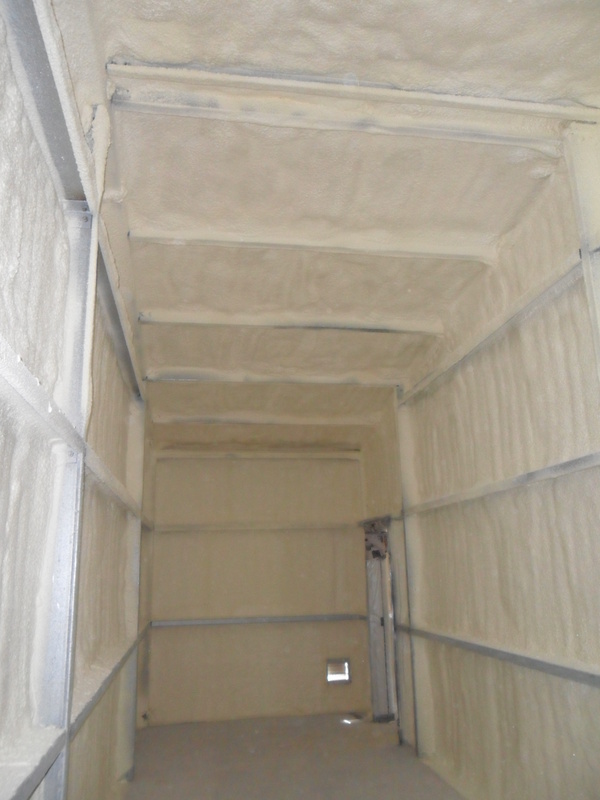 One inch of closed cell foam is what we usually recommend for buildings that will not be air conditioned, will only be air conditioned part of the time, or for residential applications where the budget is extremely tight. Keep in mind these applications are not for every climate zone. But here in Central Texas, I would choose one inch of closed cell foam in the walls and ceiling of my house over R19/R-30 fiberglass and loose fill any day. Now let’s say you added another inch of closed cell spray foam, giving you a value of R-13. Since we already eliminated all other forms of heat transfer with the first inch of foam, all we stand to gain is more resistance to conductive heat flow. What we have now is a reduction of about 93% of all heat flow. Let’s take a second to think about that. The first inch made an improvement of 90% reduction in heat flow from conduction, plus virtually eliminates any other forms of heat flow. Now we have twice as much material, and more labor to install it. Of course this is going to increase the total price significantly, but only gains us an additional 3% reduction of conductive heat flow. So why would we even want to add that second inch? Good question! In Central Texas, during the winter and early spring, the daily average outside temperatures occasionally drop down to the 20s and 30s. Granted, it’s usually only for a couple of days at a time during a cold front, but it does happen. When the outside temperature is drastically lower than the inside temperature for an extended period of time, the surface temperature of the insulation inside the wall begins to slowly drop. (Remember that it is impossible to stop heat flow, it can only be slowed down.) If the relative humidity inside the building is extremely high, the dew point inside the building may be raised to the point of the surface temperature of the insulation. If this occurs, water vapor can condense on the surface of the insulation. To prevent this from happening, we can add a second inch of insulation. 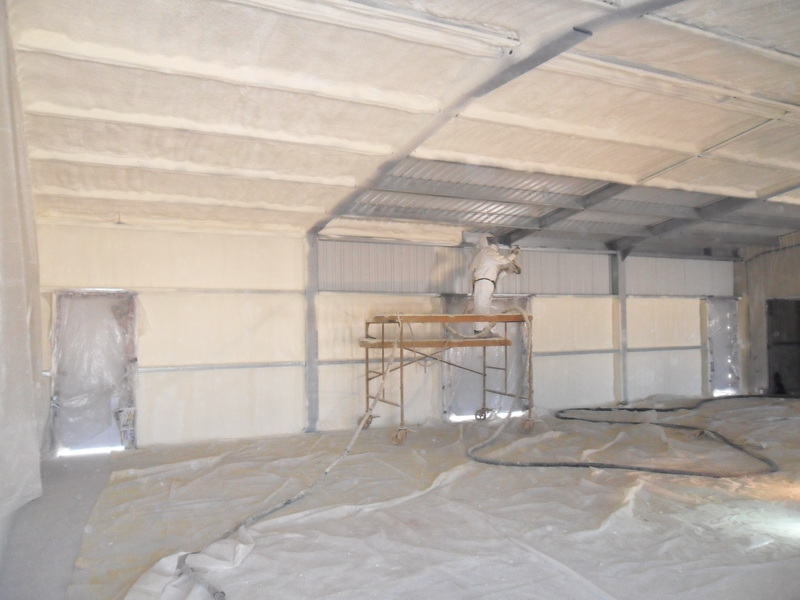 The additional insulation effectively keeps the inside surface temperature of the spray foam closer to the inside air temperature of the building, and thus eliminates interior surface condensation concerns. We strongly recommend two inches of closed cell spray foam for residential homes, and commercial buildings where there may be a concern of moisture condensation. Two inches of closed cell foam is generally the maximum amount of insulation needed for nearly all types of insulation applications we have done. Even though the R-value is “only” R-13, two inches of closed cell spray foam in the walls and ceiling of a building will outperform a building with “R-19/R-30” amounts of fiberglass and loose fill in the walls/ceiling. We consider two inches of closed cell insulation to be the optimum ratio of R-value performance and price for buildings that are conditioned full time. Hopefully, most of you are still following along, and I have made some sense of the R-value misconception. It really makes sense when you think about the basic science of how heat is transferred. It also helps to understand a little bit about how buildings are built. The most important thing to understand and remember, is that the test to determine “R-value” does not even come close to duplicating real world conditions! 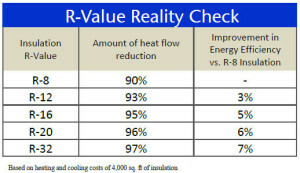 The R-value recommendations based on traditional insulation reflect that statement. If you still aren’t convinced, ask some people with spray foam insulation. They will undoubtedly tell you how well it works. If you ask me, testimonials are the most convincing form of real world test results. Hopefully, the building codes will eventually be re-written to account for the outstanding performance of spray foam insulation. It will probably take some time, as companies that make large profits from producing fiberglass, cellulose, etc. are doing everything they can to slow it down. They have been raking in the dough for a long time, and would like to keep it that way for as long as possible. But those that take some time to do the research, and learn from others who have already experienced it firsthand, can actually have insulation that pays for itself over time by way of energy savings compared to outdated insulation materials. 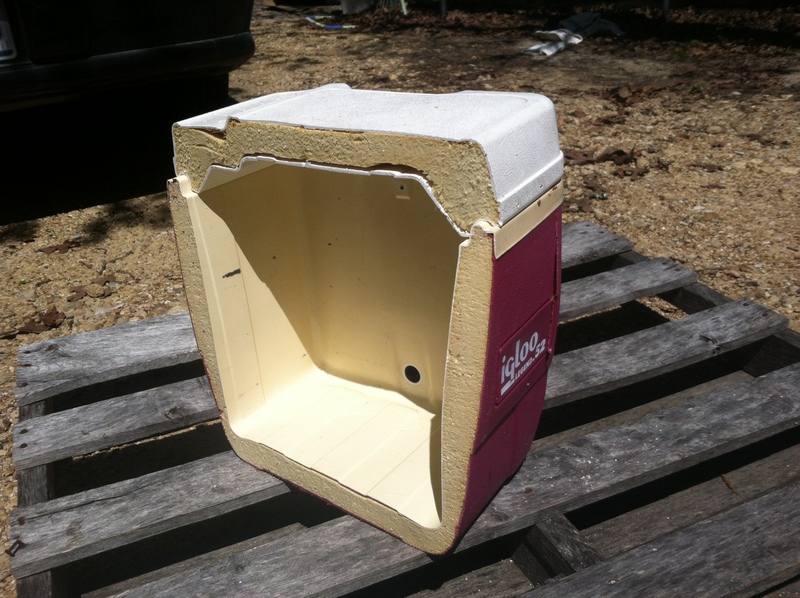 I’m going to conclude this article with one of my favorite examples of real life, closed cell foam insulation related food for thought; take your favorite ice chest/cooler. Yeti, Igloo, Coleman Extreme, etc. Some of them are able to keep ice frozen inside them for five days or more. How do you think they can accomplish this amazing feat? Cut one of them open and you will find out. You guessed it! Closed cell foam insulation! Now look at how thick the sides are. Many of them couldn’t have much more than an inch for insulation, yet they are able to keep ice frozen for nearly a week! Now imagine if you were to leave the lid propped open, even just a little bit. How long do you think the ice would last then? Don’t want to cut open your beloved ice chest to see what’s inside it? Not to worry, we did it for you. That’s right, it’s full of closed cell foam! Not only does it provide a major resistance to heat flow, but also makes up the majority of the structure. No way those flimsy plastic walls could support my 215 lbs. sitting on it without the help of spray foam! “Barndominiums” are becoming very popular these days. I myself am on the barndominium bandwagon, as it seems to be the most versatile and cost effective way to build a house. 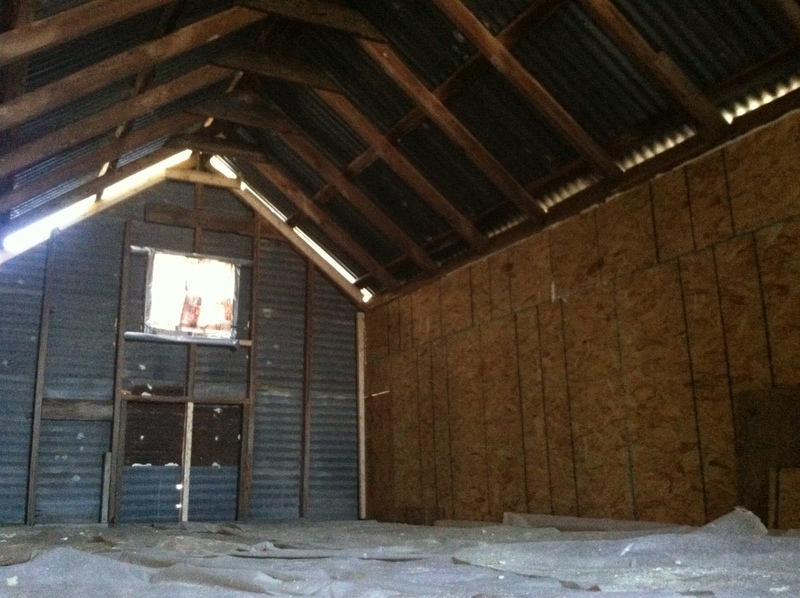 Of course, closed cell spray foam and barndominiums go together like peas and carrots. As with any other structure, closed cell spray foam seals up even the smallest openings, preventing wind/moisture/dust/allergen/pest intrusion. It also adds substantial strength to whatever it’s applied to, creating a sort of “shell” which ties the building together. 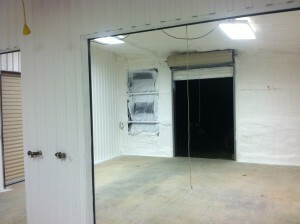 We have insulated countless metal buildings, many of them built to be barndominiums. Recently, we had the opportunity to work on a very interesting project. 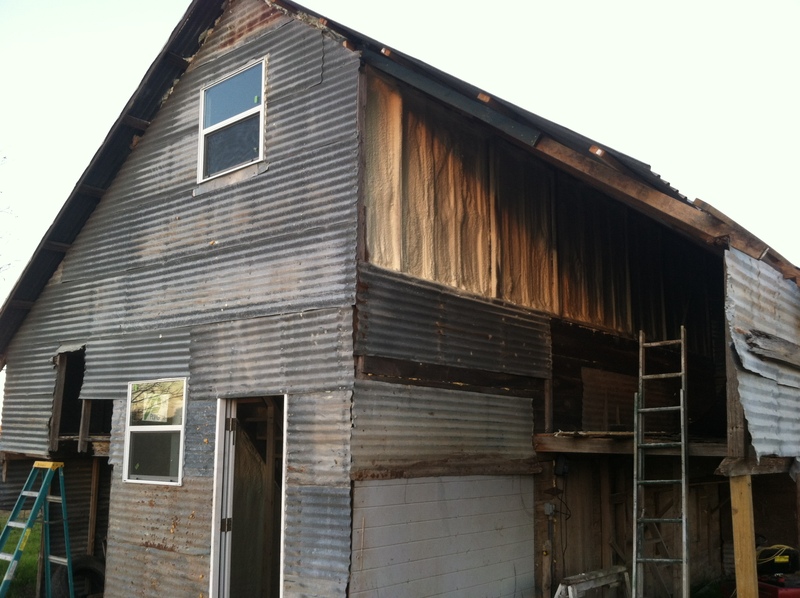 Our customer was in the process of converting an actual barn, estimated to be between 75 – 100 years old, into a two story cabin style apartment. The basic structure was still in decent shape. 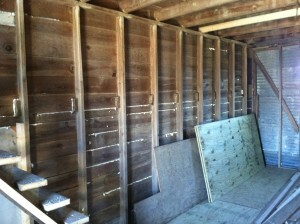 The owner had already installed a door and some windows, as well as a compact stairway. They had also replaced the upstairs subfloor. When it was time to consider insulation options, closed cell spray foam was the only logical choice. 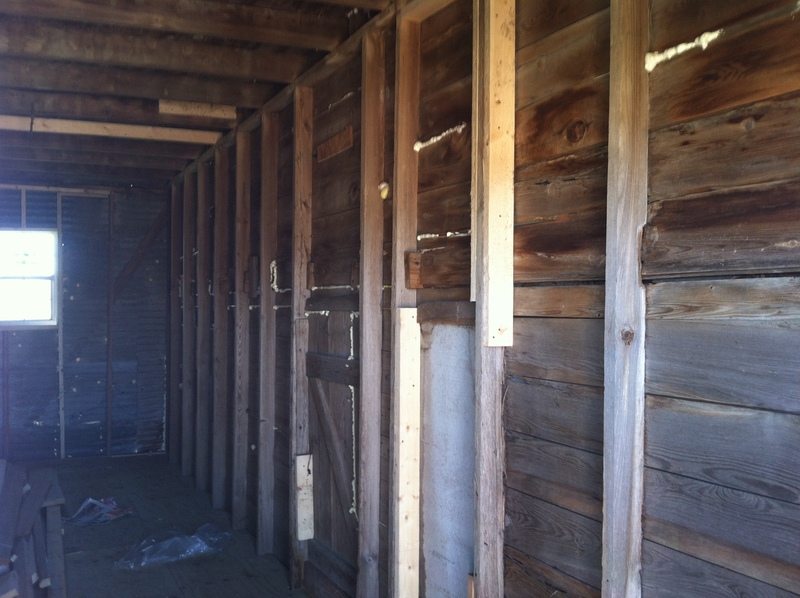 The shiplap walls were full of large gaps, and there were huge gaps between the tin roof and walls. Plenty of gaps for wind and dust and little critters to get in. 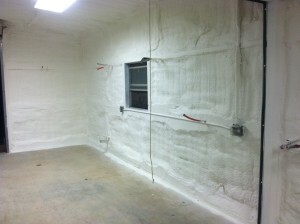 An excellent candidate for closed cell spray foam insulation. Notice the huge gaps between the roof and wall, especially above the window. Not a problem for closed cell spray foam! 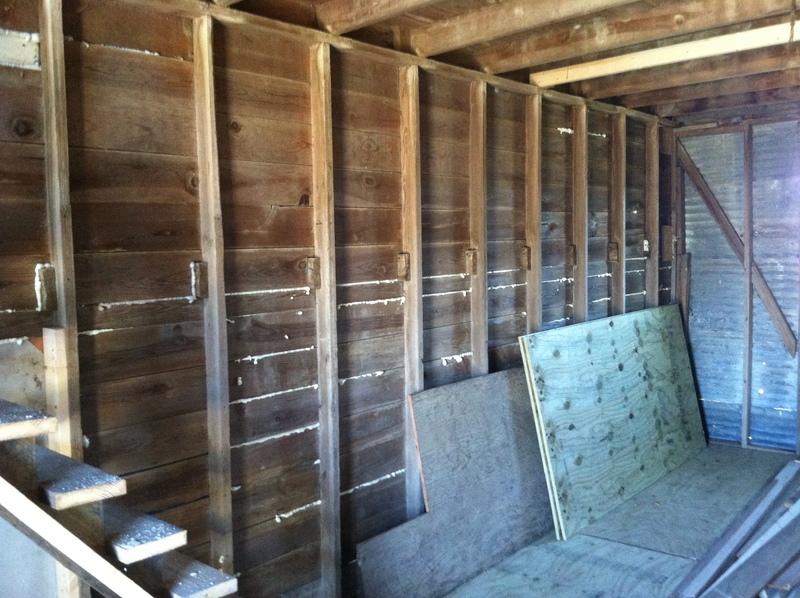 Since the upstairs side walls already had chipboard installed over the studs, the foam was installed to the outside of the upstairs walls. The upstairs side wall insulation was installed from the outside. The finished product was a virtually airtight structure, that will be very inexpensive to heat and cool. 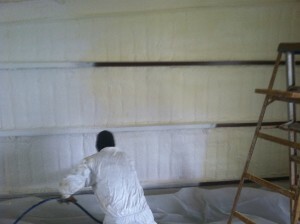 Closed cell spray foam adds substantial racking strength to any structure its applied to. It also provides a Class II vapor retarder that is always on the correct side of the wall, no matter what the temperature and dewpoint. This is why we consider it the undisputed king of insulation. 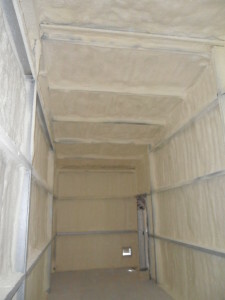 After closed cell spray foam was installed. This is going to be a very energy efficient living space, and you definitely can’t beat the character of the old barn! Notice how the huge gaps between the roof and walls are all sealed up. 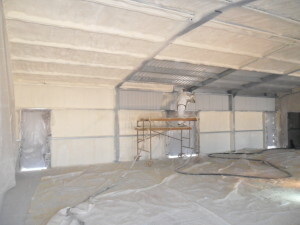 Closed cell spray foam expands approximately 30 times its liquid volume to fill even the smallest openings. I know some of you are skeptical of how a foam roof can last so long without leaking. I’m not surprised, considering that many roofing systems are prone to develop leaks in a short time. I’ve heard stories of metal roofs that leak, even though they were just recently installed, and that it’s just part of the deal! As with anything, a roofing system is only as good as the people installing it. A spray foam roof is the ultimate roofing system, but if improperly installed, can have problems as well. JLCox Enterprises has a proven track record, with over 30 years of satisfied customers. We believe in doing each job correctly the first time, even if it ends up costing us more time and money than we anticipated. We believe that in the long run, a satisfied customer is worth more than cutting corners to save a few dollars. You can call us old fashioned, but that’s just how we are. Not much is worse than paying someone else to do something, only to be disappointed with the results, customer service, and support. 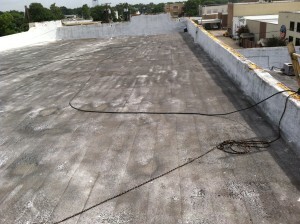 This picture illustrates how much dust and dirt can accumulate on a roof over 20 years! First step is a thorough pressure washing. Whats left of the original coating is still in decent condition, overall. The rough, orange patches are areas where the coating has eroded away, leaving the foam exposed. Even as such, this roof was still not leaking. The foam itself is practically watertight, which adds a secondary means of waterproofing. 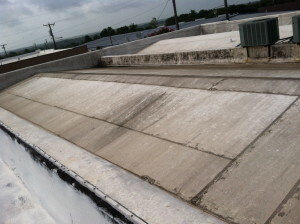 This roof was still leak-proof, despite over two decades with no maintenance! After pressure washing, a thorough inspection was performed. It was determined that the majority of the damage to the deck area could be repaired with caulking. The only area that would need to be re-foamed was the tops of the parapet walls. 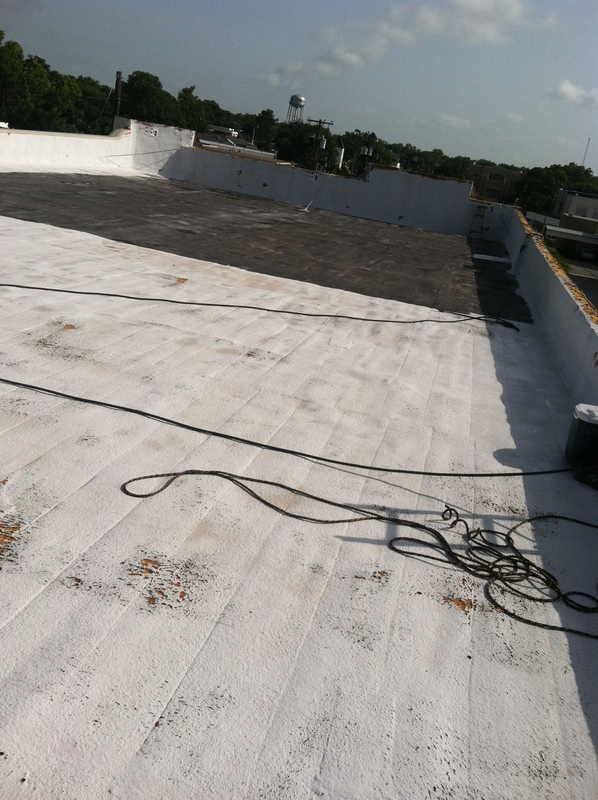 Finally, the entire roof was re-coated with an Acrylic base Elastomeric Coating. This is just one example of one of our roofs lasting for decades with no maintenance, and no problems. It is meant to give you an idea of the durability of the foam/elastomeric coating roof systems we install. It is generally recommended to reapply the coating every 10 years. When properly maintained, foam roof systems have a virtually unlimited lifespan! This simple, inexpensive maintenance plan almost always works out to be the most cost effective solution over the life-cycle of a building. This cutaway gives an idea of how thick the coating is; the bottom layer is chipboard, representing the roof deck. The middle layer is the spray foam, approximately 2″ thick. The white layer on top is the elastomeric coating, approximately 40 mils (almost 1/16 inch thick.) This is over 10 times as thick as normal latex paint! The long term cost effectiveness, durability, unmatched energy savings, and reliability are what make Spray Foam/Elastomeric Coatings the ultimate roof system. These characteristics more than outweigh any small initial cost savings that other roof systems may offer. Click here to read about why we feel “single-ply” roofs are not a good option. If you don’t see your town or zip code on the list, please feel free to call, text, or email anyway. This list is only meant to be an example of our service range. There have been several instances where we have gone almost 200 miles to do a job! They say a picture is worth a thousand words. Here are several thousand words worth of pictures for your viewing pleasure. Click on each one to view it full size. This is one of the countless LCRA substation control houses we insulated. 2″ closed cell on the walls, 4″ on the ceiling! Talk about overkill, these could easily be walk in freezers, and survive a direct hit from a tornado! Here is the battery room of an LCRA control house. Well insulated would be an understatement. Portable buildings are great for extra storage, or even for using as a living space. 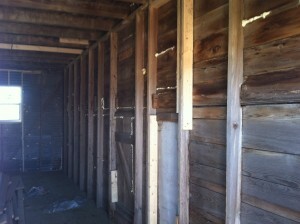 Add 1″ of closed cell spray foam and you’ve got an awesome cabin for deer camp! It’s important to understand what a building envelope is. 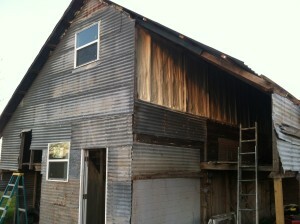 The porch roof in this picture is the floor of an upstairs loft inside the house. Without insulation here, a large amount of heat transfer would occur between outside and inside. That means a higher energy bill every time the outdoor temperature is different than the indoor temperature. This was sort of an experimental job. 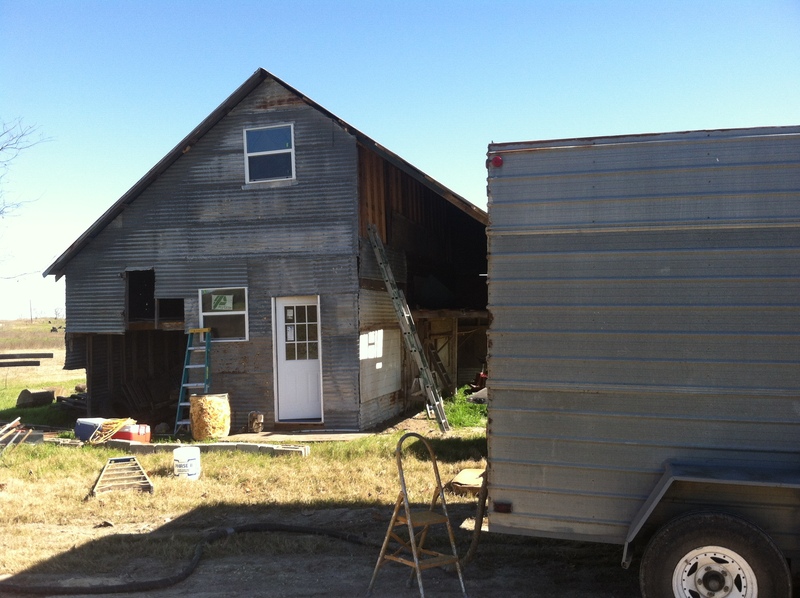 The building is used for processing poultry, and the owner wanted the walls waterproofed so they can be easily washed. 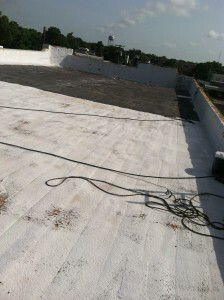 We applied an elastomeric coating, designed to stand up to punishing weather on a roof, over 2lb. 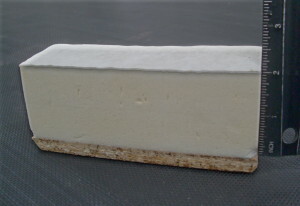 insulation foam. Think of it as paint on steroids. Here is the finished product in the processing room. Elastomeric coating was applied over the foam, purlins, and r-panel to create a seamless finish. These days, everyone is looking to save a few dollars wherever they can. I can appreciate this as much as anyone, believe me! However, sometimes “a penny saved” IS NOT “a penny earned”. Shopping out the best price for goods and services is always smart money management; however, when comparing apples to oranges, focusing on the lowest price alone makes it easy to overlook details like quality and long term durability. Single ply roofing systems are becoming popular due to their low initial cost of installation. While it is nice to save a few hundred dollars on a new roof project, it may end up costing much more in the life cycle of the building. 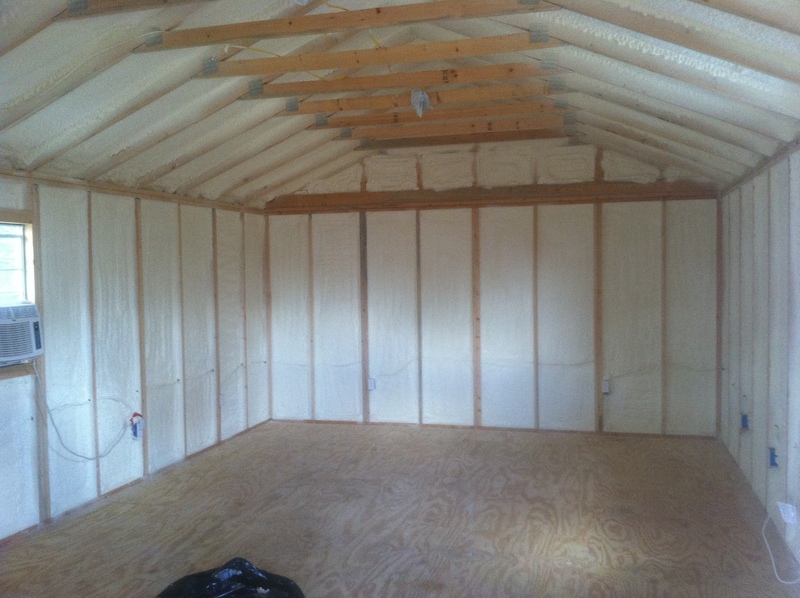 Singly ply systems use large sheets of plastic, rubber, or PVC to cover the roof. The membrane material seems to hold up well in the elements, but has a fundamental flaw in my opinion. 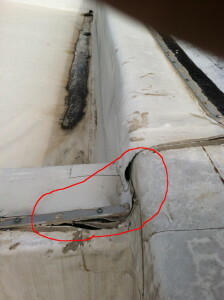 Everywhere there is a roof penetration, corner, joint, overlap in material, etc., there is a seam (or sometimes lots of seams) in the material that is typically bonded with some kind of glue. Roofs are subjected to the most extreme weather (wind, rain, burning sun), ALL DAY, EVERY DAY! On a typical single ply roof, there are hundreds, if not thousands of linear feet worth of seams. These area all liabilities for leaks to form when the adhesive fails and the wind lifts the sheets up. Notice all of the seams visible, just in this section of the roof. All of them are leaks waiting to happen! This is an excellent example of failing seams. Imagine when its raining and the wind blows into those gaps. Another issue I have with Singly Ply systems is nearly all of them I’ve seen are not fully adhered to the roof. Generally they are basically nailed down around the edges of parapet walls, with the majority of the material just loosely laying on the roof deck. 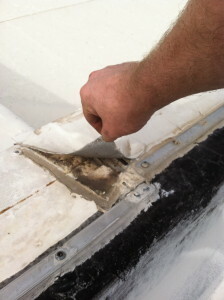 Wind is constantly working on pulling the glued seams apart, and if a strong wind gets underneath it, the whole sheet can be lifted. 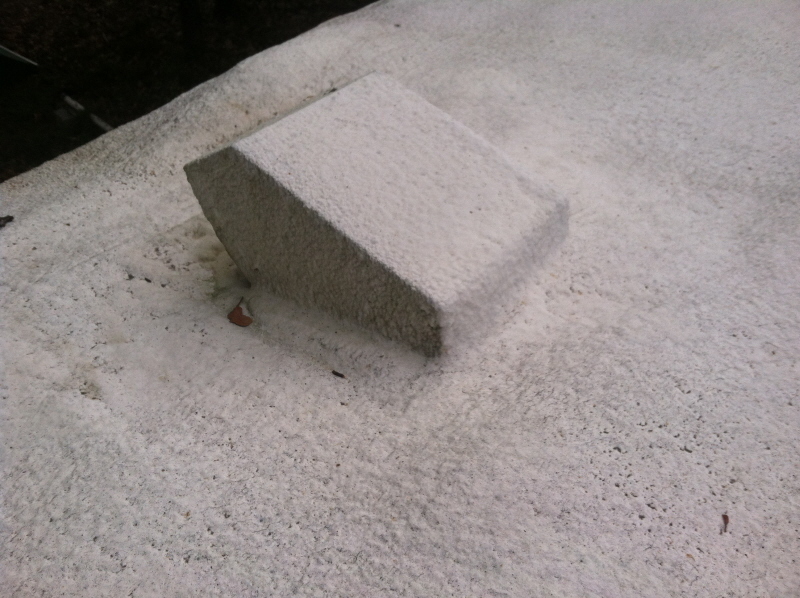 I have also seen cases where material has been bunched up around a roof drain, causing the roof to hold water. Here is another example of a failed seam. Every time this flaps in the wind, more material is lifted up, allowing more rain to enter. 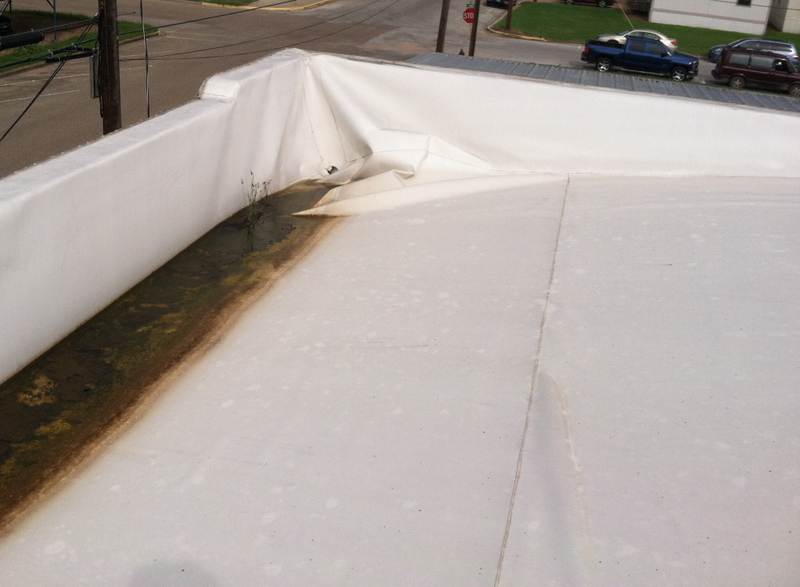 Here is an example of a blocked roof drain. Water has been standing here long enough for weeds to grow over a foot tall! As with anything, cheaper is rarely the same as better. A single ply roof will likely provide a couple years of service without problems, but it has huge potential for problems over the building’s life. Repairing leaks throughout the years caused by failed seams may end up costing significantly more, not to mention the hassle of dealing with them. 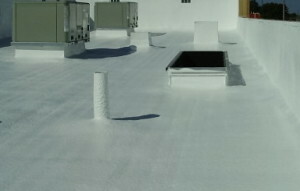 Foam roofs do not have any seams on them whatsoever! Because the foam is applied as a liquid, and part of it’s chemistry is basically gorilla glue, it is fully adhered to the entire roof area! Because of the foam’s rigidity, the entire roof structure is strengthened as it all becomes tied together. The elastomeric coating is also applied as a liquid, and also has excellent adhering properties. This system is self flashing, which means it automatically seals up transitions, penetrations, etc. without any additional flashing mechanisms. 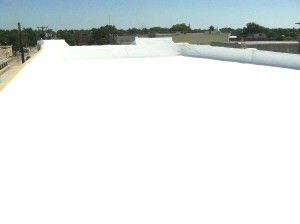 A closer look at how there are no seams whatsoever on our foam roofs. No seams = nowhere to leak! Furthermore, since the foam itself is virtually watertight, two levels of waterproofing are provided. Even if the coating is punctured, the foam still resists moisture penetration. If the foam is punctured all the way to the roof deck, water is still prevented from traveling under the foam, because it is fully adhered to the roof. Puncture repairs are typically as simple as filling the hole with acrylic caulking. This is why our roofs have a proven track record, even when maintenance is neglected, often lasting decades without any problems. “If it’s worth doing, it’s worth doing right.” – Jim Cox, Sr. Welcome to Foamit.net, home of JLCox Enterprises! Hello, and thank you for visiting our new website. Please be sure to check back for updates.